• Efficiency of Brazilian public ports and terminals with different characteristics , by Rodrigo Ferreira Bertoloto, João Carlos Correia Baptista Soares de Mello [paper in Portuguese]. • Proposed methodology for choosing the the road of dangerous goods carriers with focus on risk management, by Marne Lieggio Júnior, Sérgio Ronaldo Granemann, Osmar Ambrósio de Souza [paper in Portuguese]. • Demand distribution estimation in São Paulo metropolitan region with scenarios of a new airport, by Anderson Ribeiro Correia, Lucia Erika Niyama, Sabrina de Araújo Furtado Nogueira [paper in Portuguese]. • Simulation model of a baggage claim device coping with a new large aircraft (NLA), by Rogéria de Arantes Gomes Eller, Milton Valdir de Matos Feitosa, Protógenes Pires Porto [paper in English]. • Network maximum flow algorithms applied to air traffic flow management, by Cícero Roberto Ferreira de Almeida, Li Weigang, Antonio Pedro Timoszczuk [paper in Portuguese]. 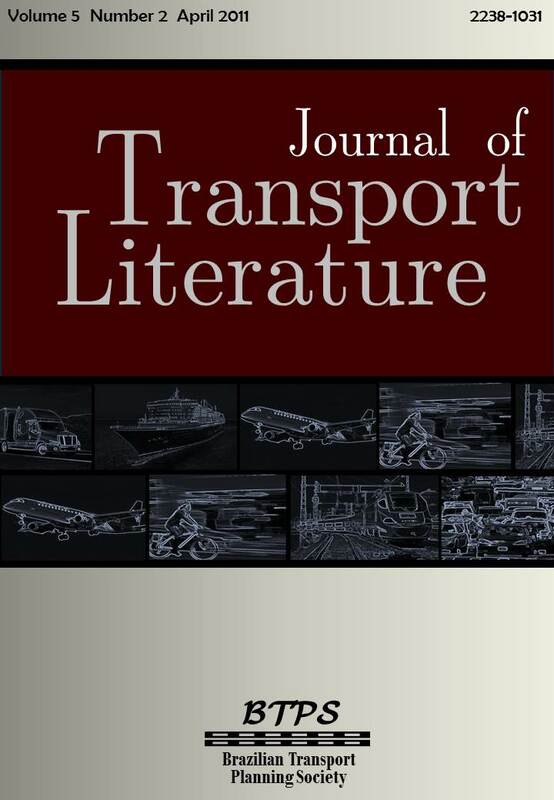 • Air transportation - an alternative to road transportation of cargo, by Douglas Amaury Bez Batti, Carlos Alberto Faria [paper in Portuguese]. • Assessing Concentration and Identifying Hubs in the Brazilian Air Transportation Industry, by Tiago Fernandes Gondim Costa, Guilherme Lohmann, Alessandro V. M. Oliveira [paper in Portuguese]. • Evaluation of alternative means of fuel transportation along the Tiete River region, by Aline Flavia da Silva, Luiz Antonio Tozi [paper in Portuguese]. • Analysis of the Effects of Airline Mergers, by Sidneia Rocha de Sousa [paper in Portuguese]. • Comparative analysis of air transport regulation in USA and Brazil: short notes, by Osvaldo Agripino de Castro Junior [paper in Portuguese]. • The Brazilian ATC between September 2006 and March 2007: the operational rupture, the administrative model and perspectives, by Bemildo Alvaro Ferreira Filho [paper in Portuguese].